I mean, I don't like vegetables as much as bacon or steak, but I'm not NEARLY as scared of vegetables as these cats are. 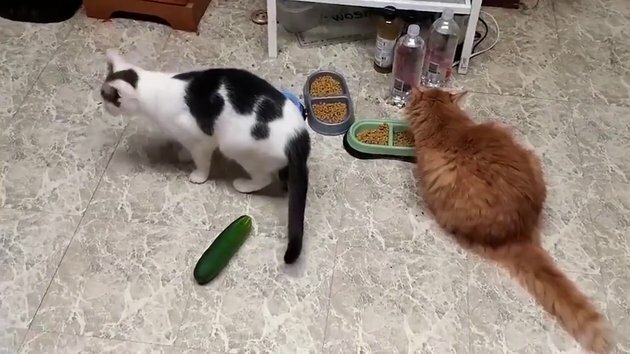 ofc I don't have any cucumbers, now that this video got me curious how my cat would react. #3 buying a cucumber on my way home. Does anybody have even the slightest idea why they react like that? Whew, was nervous to click on this one, the title didn't seem to befit SNOTR. #5 i think they placed the cucumbers there while the cats were unaware of whats happening behind them. and ofcource the shape and color of the veggies activate the ejector pins in the whiskers of the cats also. I tried it with a zucchini and the cat couldn't care less. Now I am wondering if the cat is too chilled, or if I picked the wrong vegetable. More testing needed. 0:17 and 0:24 were zucchinis actually...try a different vegetable, like a peppers, that one sounds scary.